Let me preface this by saying, I’m going to try to contain my excitement and not type in all caps. A couple weeks ago I saw Caroline posted in her Sew Caroline Facebook group looking for a few pre-testers for the Primrose Peplum. I thought about it for 0.2 seconds and signed right up. I had never tested a pattern before, but it has been something I’ve wanted to do. I love Caroline’s patterns so I would have been silly not to sign up! When I got the email from her I was so excited that I immediately started planning different versions I wanted to make. I remember seeing the sneak peak she posted last fall and thinking that I’ve been waiting for a pattern just like this. This was such a fun experience to play even the smallest role in the process and it’s one I hope to have again! So, without further delay, the Primrose Peplum is a woven peplum top with two skirt options and five sleeve options. 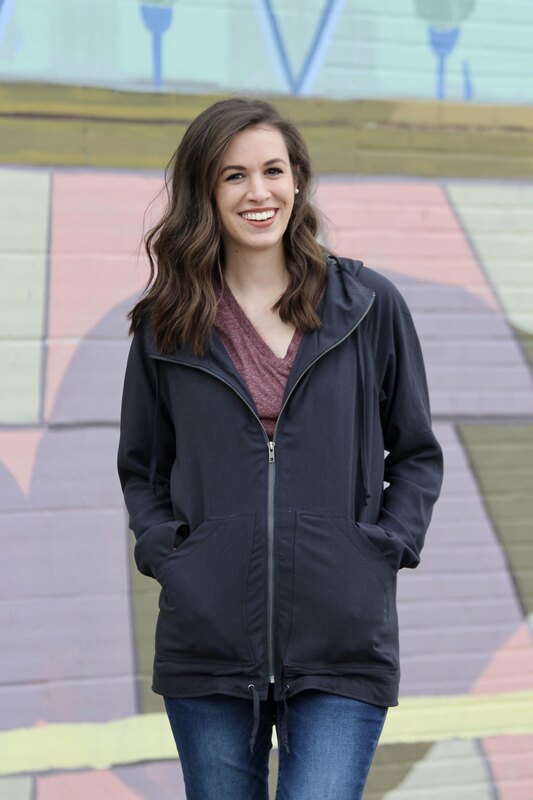 It features front and back darts and a zipper closure. Just like all of Caroline’s patterns, the Primrose Peplum has great instructions that make sewing this top easy and enjoyable. And of course, the the top is so versatile! From work to date night, you can sew up a top for every occasion in between. I sewed up the circle skirt with the elbow length sleeves and bell cuff using some mid-weight peach skin from Joann. I love all things maroon (partly a side effect of going to Texas A&M, but mainly because it’s just a gorgeous color), so it was not a hard sell when I saw it. I went with a straight size small, which works well with the circle skirt even though my hips put me at a medium. The bodice is fitted, but not so much that you feel like you can’t eat anything while wearing it, which is extremely important. The bell cuffs are the cherry on top of this adorable blouse. I was a little skeptical at first, but once I finished the top I was so happy that I kept them. This top will be perfect for date nights and weekends. I can’t wait to make a few that will pull double duty for work; one of which I’m planning on sharing with you later this week! I think a chambray version with an exposed zipper would be super cute for spring/summer, too. However, the version I’m probably most excited about is going to be a circle skirt version using some fabric I got while we were in London a couple years ago. When I bought it I knew I wanted it to be a peplum top, so I’m really excited to have such a great pattern for this fabric! As you can probably tell, I really like this pattern and I think you will too! Go check out Caroline’s shop and pick up the Primrose Peplum! p.s. I’m linking up with Allie J.’s Social Sew! February’s theme is Date Night. Click the picture to check out what other sewists are creating this month! Love this so much! I downloaded the pattern last night and sewed up the circle skirt version too! Such a great sew. I LOVE LOVE LOVE your top!!!!! Such a perfect color:o) And the pattern…..amazing!!! Super cute! I just discovered your blog from the Allie J link up. Your photos turned out beautifully. This looks great on you! I came over from AllieJ to see what fabric you used. Really cute!